A Canadian log home package is great for your local economy…no matter where you build! We’re often asked if we build the whole house…and the answer is no. Why? Because we believe that there is a better way for you to get the best home possible. We deliver superb quality log work hand-crafted by experienced log builders. Our craftsmen each have 20 years of experience and a lifetime of pride in their work. As a superior log provider we are part of a team that includes local professionals to ensure your home has the best man or woman for every part of the job! Benefit from the expertise, skills and years of experience that each tradesman brings. Team work gets the best results every time! Your general contractor is the expert on factors in your area including building codes, geological issues, and weather patterns. He or she can will have the knowledge to select the most talented local sub-trades and the most reputable local suppliers: your contractor’s network is a great advantage to you! For over 40 years we have partnered with contractors and craftsmen who are experts in their field. With each tradesman standing behind the quality of his work, you can be assured of the highest quality home. Building a log home brings people together in an exciting adventure as they create a landmark built to stand the test of time. 1. 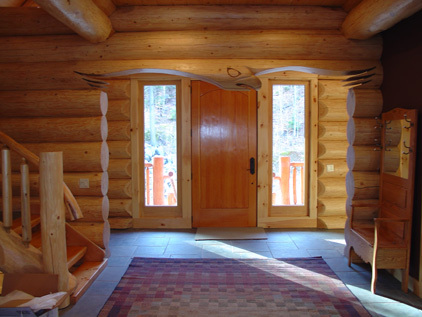 Completing your custom log home with windows, doors, lumber and plywood, etc. from a local supplier means you pay less in total shipping costs. 2. You will have a greater selection of windows, doors, and finishes than you would find in a “log cabin kit”. Splurge where it’s important to you and economize where you want. 3. Involving local businesses in your project helps create a solid community network and ensures that you will get competitive prices and prompt attention when you need it. Relationships you build during the construction of your log home will benefit you in many ways over the years. 4. A local building supply store will often take back unused material for credit that you can put toward other necessities. 5. You get the knowledge and experience of a handcrafted log home company in business for 40 years + the advantages of supporting local merchants and employing local trades. Back to log homes SEE PHOTO PortfolioSEE BUILDING PROCESS Contact UsWhat’s Included In a Log Package?